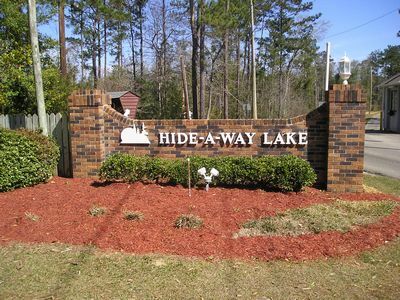 to Hide-A-Way Lake Community. We are a private community located in a beautiful setting, designed to provide residents with a relaxed, pleasant and secure way of life. The beauty of our community is something we value highly and requires continued interest and co-operation of all who live here. To help you understand how the Hide-A-Way Lake Community operates and the part you play in the lifestyle that you have chosen, we have created this website with information that will answer many of your questions. Included is information about our facilities and amenities, a description of our organizational structure, its responsibilities, rules and regulations. We have also included some information on area services. We hope you will enjoy living at Hide-A-Way Lake Community and make full and caring use of the many amenities. We encourage you to stop by our office and become acquainted with the professional management staff who can give assistance and suggestions to make your transition to a new community easier. You are also encouraged to attend the monthly board meetings.